Seward County Community College trustees approved a final reading of the college’s updated weapons policy Monday evening, in anticipation of the state law change that takes effect this week. 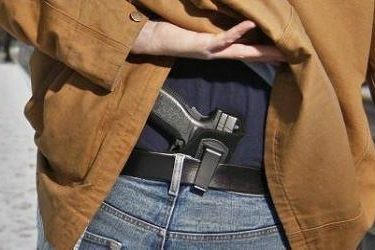 On July 1, 2017 Kansas law will allow legal citizens at least 21 years old the right to carry a concealed weapon onto a college campus. The new law is distinct from Kansas’ open-carry statute. Open carry of a firearm on the SCCC campus is prohibited, as noted by public signs postings throughout all campus locations. The college will comply with state law in permitting open carry, with qualifications. SCCC President Dr. Ken Trzaska said the policy update reflects the college’s commitment to operate in compliance with state law, while focusing on the everyday realities of campus life. “Our focus — which is one of our five directions, or strategic goals — is to foster a safe and healthy learning environment for our students,” said Trzaska. Director of Safety and Security Dennis Mulanax, a veteran police officer and concealed-carry instructor, worked closely with the college board and legal counsel to create a policy that complies with Kansas law and focuses on safety for students, college employees, and the public. Mulanax pointed out that in all locations on campus, the purchase, storage, carry, transport, use, and sale of a firearm is considered strict liability. This means that everything associated with the firearm has liability assigned to the person(s) having such responsibility. For instance, a firearm owner must have the weapon on his/her person or within reach at all times. Concealed carry means out of sight and therefore out of the mindset of another person. For the security of those students who reside in the Campus Living Center where those who are older than 21 are eligible to legally own firearms, the college has gone “above and beyond” and will install 10 gun safes before the halls open for the fall semester. SCCC continues to strive and promote peace and compliance to the law. Employee training sessions and concealed carry classes offered through the Business & Industry Division teach nationally recognized defense options that have already proven effective in other work places, schools, hospitals, and colleges, etc. Run, Hide and Fight and/or A.L.I.C.E. defense strategies and concepts have already proven to be highly effective. The SCCC Board of Trustees approved the second official reading of the weapons policy, which can be viewed by the public at the SCCC library, or via the college website, under the “About” tab by following Board of Trustees > Meeting Dates > Board Docs > Agenda for June 23.